On Saturday the 14th of February I was privileged to be involved in the museum’s early opening for children with autism their families and carers. 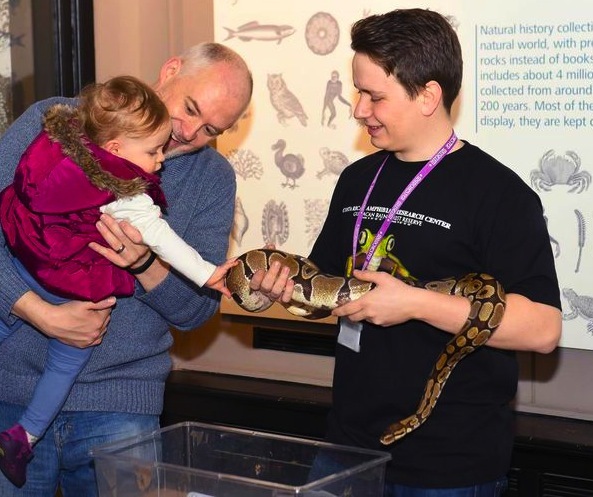 This month it was the turn of The Vivarium and Nature’s Library galleries to open up an hour early, during which time we ran a number of activities and handling tables to help make this event extra special. I was able to introduce these lucky visitors to some animals from our collection, chiefly the royal python and some of our fire salamanders, who all proved to be big hits with everyone, even those who were a little scared at first were won over in the end. During normal opening hours the museum galleries can sometimes be a bit busy and overwhelming for these particular families and children, so it is brilliant to be able to offer these more personable opportunities to explore, learn and have fun in a more comfortable atmosphere. As you can see from these pictures everyone, I myself included, had a great time and it was a real pleasure to take part. Animals have a remarkable ability to connect and amaze all kinds of people and the joy they generate is something worth cherishing. A quick thank you is in order to all those who took part and who attended and helped make the morning such a success. All images courtesy of Joe Gardner ©.